Thanks, it’s really encouraging receiving feedback! Wow Chanelle and Craig! That’s brilliant. A huge well done. 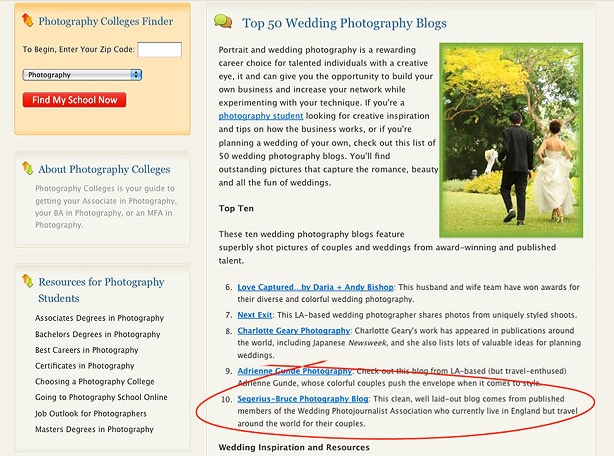 Chanelle & Craig – having spent an hour looking through your blog I can see why. An absolutely stunning body of work. I imagine you’ve got a very busy 2011 ahead of you! We enjoy your site and all the hours of hard work you put into it. It really shows. Can I ask how you got your navigation menu to look so cool? I’ve been trying to do almost something similar on my website for quite some time but I can never get it to work. Thanks for any help you may be able to offer. Hey where can i get the rss feed of this? I want to say thank you for sharing the links to the top fifty blogs. I visited some of it and I find it very inspiring. What kind of tools do you use for post processing? Can you explain your work flow? Thanks. Your website is well informative. I would suggest my friend who is a photographer to visit here and check out the blog.